The GP-M3000 easily manages stand up pouches, pouches with side gussets, flat-bottom or 3-side seal configurations. This machine effortlessly seals pouches with reclosable features, such as Press-to-Close Zipper, eSlider and velcro. Massman Automation is General Packer’s exclusive North America Authorized Distributor. General Packer Co., Ltd. specializes in the design, manufacture, and sale of high performance, automatic packaging machines. The original "set-up type" pouch filling-sealing and nitrogen gas flushing systems has made General Packer the industry leader with more than 2,000 packaging systems to customers worldwide. General Packer has experience filling stand-up pouches with dry goods including, milled and ancient grains, powders, candies, pet food, health foods, medicines, and medical supplies. Allows for easier, quick loading of bags into the conveyor. Precisely transfers bags from Conveyor to Bag Aligning Unit. Dramatically reduces bag transfer failures. "SPS" Bag Aligning Unit controls & adjusts bag width, height and orientation. Protrusions, compared with existing model. with existing model requiring 30 minutes. Opening, Gripper Width, Vibration and Heat Sealing! Mechatronic Design Technology significantly reduces eDecreased 10:1 change-over time when compared with existing model requiring 30 minutes. 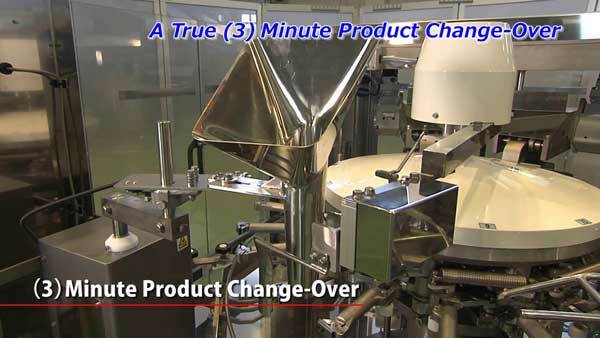 eDesigned to Automatically Adjust Bag Feeding, Bag Opening, Gripper Width, Vibration and Heat Sealing! eMechatronic Design Technology significantly reduces Operator adjustment time. GY - The bag feed system is to automatically supply bags one by one from the bag feeder previously set with several hundreds of bags. USR - Correspond sealed to standing three-side-seal pouch. bag, Also four-side-seal applicable to bag, or four-side-seal bag with fastener. UST - Almighty highest-end model capable of handling standing pouches with fasteners. Three tapping factors: Bottom tapping time, frequency and strength are adjusted automatically. eTapping Strength and Height can be optimally adjusted for each product. Installed Mechatronic Heat Sealing Unit. Application Registration System allows quick and easy bag changeover; adjustable sealing pressure, temperature and time settings. Improved Surface Print Area has Doubled, compared with existing model. Designated Printer able to handle various types of Bag Design.